Cavens House is a beautifully restored Georgian country house that the Fordyce family purchased in 1999. Once owned by wealthy merchant, Sir Richard Oswald, their dream was to restore the tired house to its original state, celebrating its tradition and history. After an intense few years of renovation Cavens was opened to the public and is now approaching its 20th anniversary and is considered one of the places to stay and dine in the south of Scotland and has received numerous awards to verify this. The truly family team of Angus, Jane and their two daughters, bring a warmth to the house that is impossible to duplicate. Dishes are prepared and cooked by Angus in their traditional kitchen, which celebrate the best produce the area has to offer. Focusing of seasonal produce, Cavens serve high-quality traditional dishes throughout the year, that most people are familiar with, however, have never tried to the standard that Angus Fordyce can prepare them to. Their rooms ooze character and charm making it the perfect getaway for all seasons. From exploring the local beaches and hills in the warmth of the summer sunshine, to being tucked up in the lounge with a dram sitting by the roaring fire, Cavens is a glorious retreat for anyone. Angus Fordyce trained at Peebles Hydro during the 70s and then spent a number of months in Paris learning from the famous Parisian chefs. He then returned to London where he worked at the world renowned 90 Park Lane, the flagship restaurant of Grosvenor House. During his time, he has worked with highly influential chefs such as Anton Edelman and Mark Hix, where he found his love for the finest ingredients. The local area of Dumfries and Galloway has a bank of suppliers renowned for the quality of their produce. Cavens House ensures they are utilising this produce to the best of their ability and celebrate it through their variety of dishes. Focusing on seasonal produce, the Cavens menu is always adapting to support what is at its best during that time. Examples of this include locally shot grouse and Scottish soft fruits and asparagus. Their list of local suppliers is extensive, which they display throughout the restaurant and house. Particular hero suppliers include The Barony Smokehouse and Country Foods. Based in Lochmaben, they supply Cavens House year-round with world class Scottish smoked salmon and other smoked goods as well as game that is locally kept and shot. Angus’s venison steak and redcurrant sauce is one that is particularly popular with guests and has received rave reviews. 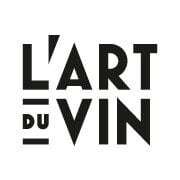 L’Art Du Vin is a merchant made up of wines produced with passion, integrity and uniqueness of origin while remaining true to environmental and ethical issues. They support vineyards from across the globe and are very proud of their extensive wine offering. Based just north of Edinburgh, they are a leading wine merchant for Scotland and supply a number of the top restaurants in Scotland and beyond. Constantly on the search for new and exciting wines, L’Art Du Vin are pioneers of the wine merchant world, focusing on natural and organic wines. 1. Preheat the oven to 200°C. 2. Rub the grouse breasts with butter and season with salt and pepper. Then place a knob of butter and a sage leaf in each cavity. 3. Roast in the preheated oven for 20 minutes basting a couple of times. This will cook the birds to medium. Adjust the time as to how you prefer your meat cooked. 4. While the birds are roasting, melt a little butter in a pan and fry off the diced onions until cooked but not coloured, then add the diced liver (if you have it) and cook on a high heat for a couple of minutes. 5. Once cooked, whizz in a food processor to a paste or pate. If you haven’t got the grouse livers a good quality Brussels pate will work just as well. 6. Next, fry the bread on the hob to make nicely browned bread. Cut into diamond shapes to make large croutons and spread with the liver pate. 7. Remove the grouse from oven once cooked and transfer on to a warm plate and rest. 8. Reserve the roasting juices to make a wine gravy. Place a roasting tray, with the juices, over a medium heat and add the red wine to de-glaze the pan. Add bacon lardons for extra flavour. 9. Next, add the stock and leave it bubble away for a few minutes. Add a little cornflour to thicken the gravy, if desired. 10. 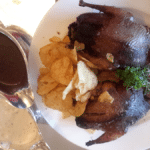 Serve the grouse on or off the bone with the pate croutons, gravy and bread sauce and garnish with watercress and some game chips. Bread Sauce recipe 1. Add the milk to a pan and heat. 2. Stud the half onion with cloves and place in the milk pan. Add the bay leaves, nutmeg and black peppercorns. Bring to the boil and simmer for a couple of minutes. 3. Turn the heat off and leave for at least 20 minutes for flavours to infuse. Season to taste with salt and pepper. 4. Pass through a sieve and discard onion, bay leaves and whole peppercorns.